Archetypal dream of the South Seas, the island floats like a mirage Master of the lagoon. Amidst a unique marine reserve of 200 hectares, only 20 minutes by boat from Noumea, this exceptional hotel offers the traveler the luxuries of tropical tranquility. Featuring the only overwater bungalows in New Caledonia, the L'Escapade Island Resort Noumea is quite popular with Australians and Kiwis for whom the flight is short and direct. 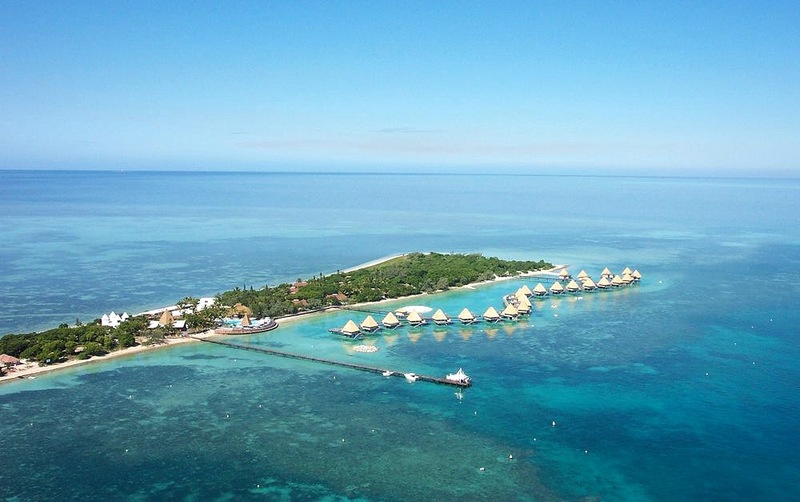 The 25 overwater bungalows are large and luxuriously appointed, plus there are 44 island rooms to complete the set. Formerly known as the Coral Palms Island Resort, this place is actually southwest of the main island of New Caledonia, and accessed by the resort's own boat which makes 7 trips to the mainland per day, the setting is ideal. The L'Escapade Island Resort Noumea is located on a small private island just southwest of New Caledonia's capital city, Nouméa. To reach the L'Escapade Island Resort Noumea you'll need to fly to New Caledonia from either Paris, Auckland, or Australia. Once there you'll transfer to the harbour for a 25-minute boat trip to the island on their private yacht.